Truman Medical Centers President and Chief Executive Officer Charlie Shields has named Mark T. Steele, M.D. ’80, chief operating officer, responsible for the clinical and business operations of TMC. Steele will continue to serve as TMC chief medical officer. He also serves as UMKC School of Medicine associate dean of TMC programs and University Physician Associates executive medical director. Steele said that in his new role he intends to focus initially on quality, productivity, patient safety and satisfaction, and patient throughput. 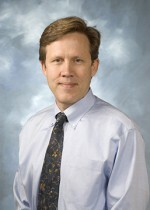 Steele has served on the faculty in the Department of Emergency Medicine at the UMKC School of Medicine/Truman Medical Centers since his graduation from residency in 1983. He is currently a professor in the Department of Emergency Medicine and served as the emergency medicine residency program director and as chairman of the department from 1996 to 2000. Steele is a nationally-recognized emergency medicine physician with many awards and more than 100 published journal articles, 50 of which are in premier emergency medicine journals. His interests have been in the areas of infectious disease, wound care, circadian rhythms, shift work, emergency medicine practice and workforce issues. Steele is a member of EMERGEncy ID NET, a national emergency department-based emerging infections sentinel network. He also served as president of the American Board of Emergency Medicine in 2010. Among his awards, Steele received the School of Medicine’s 2000 E. Grey Dimond, M.D., Take Wing award, presented to alumni for outstanding achievements in their medical field. He has also been named as one of Ingram’s Top Doctors of Kansas City. Other honors and awards include becoming a fellow of the American College of Emergency Physicians in 1988, the UMKC Alumni Achievement Award in 1990, induction as a faculty member into Alpha Omega Alpha honorary medical society at the UMKC School of Medicine in 1992, and receiving the UMKC School of Medicine Excellence in Medical Education award in 1992. He is a member of the Society for Academic Emergency Medicine, the American College of Emergency Physicians, the American Academy of Emergency Medicine, the Missouri State Medical Association, and the American Medical Association. In 2003, Steele was selected to the Board of Directors of the American Board of Emergency Medicine, where he served as President in 2010-2011. He also served the board as an item writer, chief examiner for the oral examination, chair of the Test Administration Committee, and chair of the Emergency Medicine Continuous Certification Task Force. He continues to serve as an oral examiner.